Purex No Sort for colors laundry detergent features features a breakthrough Anti-Color-Transfer Technology™ which traps loose dyes in the wash, and prevents them from settling onto other fabrics—leaving your clothes bright and clean without color bleeding accidents. For the busy mom, this Purex detergent is a dream. Now I don't have to worry about the red table cloths being mixed in with brown dish towels. Less sorting means more free time for me. Since Purex is always a great value, now I have more free time and money for that elusive mani-pedi. While this detergent offers a great solution, some items work better than others. I wouldn't laundry dark wash jeans for the first time or other heavily dyed fabrics. This product works well but nothing can perform miracles. 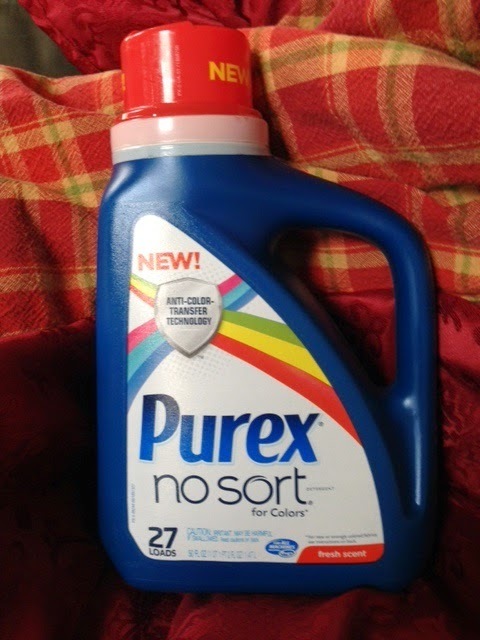 Would you like to try some Purex No Sort for colors laundry detergent in your household? I have 3 Purex product coupons to giveaway. Please use the Rafflecopter to enter. Disclosure: I received this product to review and coupons to giveaway. All opinions are my own.